In the book The Pencil Perfect: The Untold Story of a Cultural Icon, author Caroline Weaver tells a charming story from her childhood about a box of Caran d’Ache Prismalo colored pencils that her mother brought her from a trip to Europe. A prized possession, the set was the genesis of what was to become a lifelong passion for pencils. Delighted by the story, I was also intrigued to learn the Prismalo name. 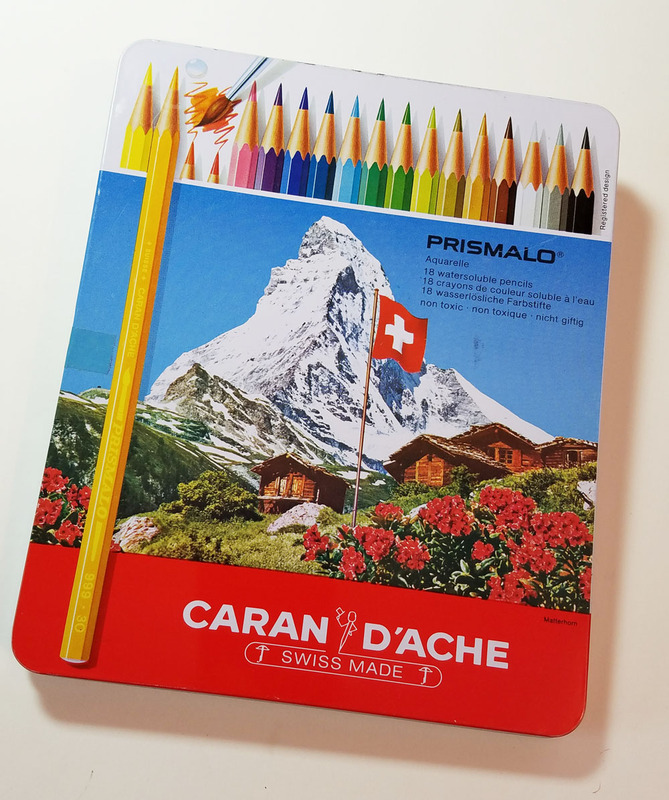 Caran d’Ache is my favorite colored pencil brand, and I thought I was familiar with all of the Swiss company’s contemporary pencil products. Was Prismalo no longer produced? First introduced in 1931, Prismalo was the world’s first water-soluble colored pencil, it turns out. Whether the pencils are still being made by Caran d’Ache, however, is still a question. I couldn’t find them on Caran d’Ache’s website, yet they do seem to be available on Amazon (at the kind of inflated prices often seen on discontinued products). Other sites seem to mention or show them, but they don’t offer them for sale. Perhaps they were discontinued in the recent past? A little further digging revealed several “vintage” sets available on eBay. I had no idea how old “vintage” was in this case (Caroline received her box when she was a child in the early ‘90s, and I’m sorry, but I refuse to think of the ‘90s as “vintage” – bad enough that the ‘80s and ‘70s are), but a used set of 18 on eBay for a reasonable price (lower than a new box on Amazon) was just what I was looking for to scratch my curiosity’s itch. Although billed as “lightly used,” the pencils I purchased hardly showed signs of use – all still had factory sharpening. When I sharpened them myself, they gave off the lovely scent of cedar. The tin’s lid shows an image of the Matterhorn, which appears in varying ways on all the images of Prismalo boxes I’ve seen. 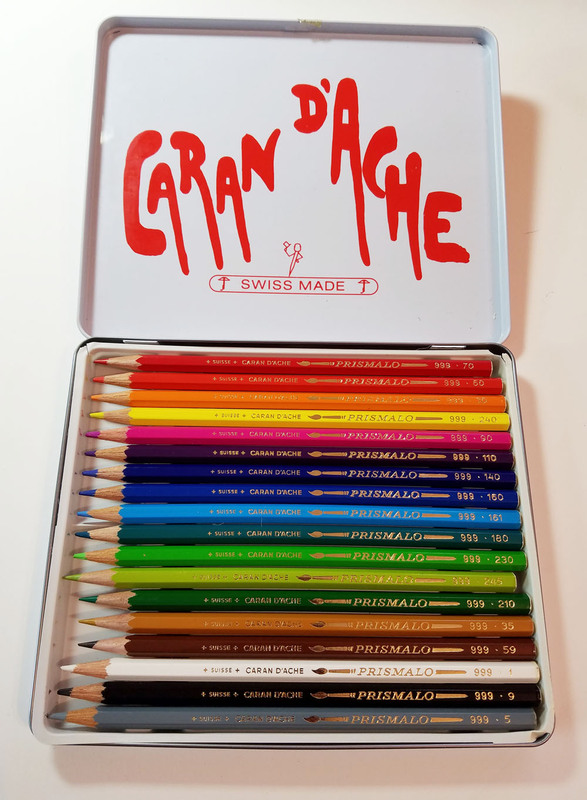 What I think is more special than the Matterhorn, though, is the little pencil guy next to the Caran d’Ache name. Extrapolating from The Pencil Perfect, the icon is a variation of Bonne Mine, a cartoon figure that was used in advertising back in the ‘20s. The icon on my box has lost his facial features and is most certainly newer. As I gave the Prismalos initial test scribbles, I wondered where this collection of pencils stood, in terms of quality, in Caran d’Ache’s product family? Before acquiring them, I already owned what I thought were the only three lines of water-soluble pencils made by C d’A – student-grade Fancolor (which I reviewed a while back), artist-grade Supracolor II (which I didn’t review but showed in use during an interesting limited-palette challenge) and premium-quality Museum Aquarelles, my long-time favorite. Marketing copy seemed to indicate that Prismalos were of “premium” quality (but then, what does C d’A make that they wouldn’t call “premium” to go with their prices?). 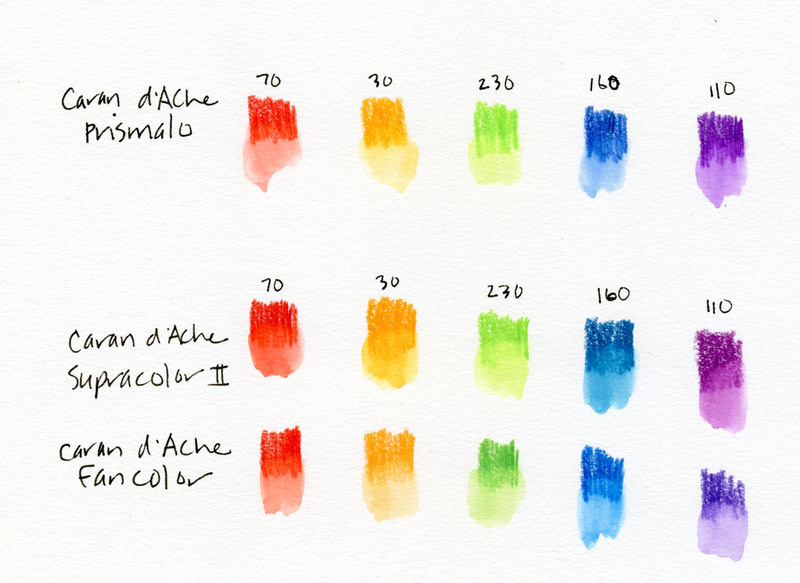 I could tell just by swatching that they weren’t as soft and rich as Museum Aquarelles. They felt a little harder than Supracolors but softer than Fancolors. 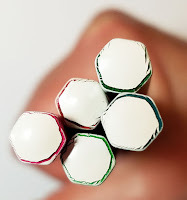 I noticed that the Prismalos and Supracolors were printed with consistent color numbers (a very nice feature for any colored pencil manufacturer to use is consistent color numbers, regardless of the line or product quality). I picked out five hues that were available in both sets to compare. As you can see from my swatches below, the colors might have the same number, but they aren’t necessarily exactly the same. Dry, the Prismalos look a little less vibrant than the Supracolors, but the real test came when I activated the swatches. As I always do when testing water-soluble pencils, I gave each swatch a quick one-two swipe with a waterbrush, avoiding scrubbing. In every case, the Supracolors dissolved more completely and quickly, and the washes were richer and more vibrant. Surprised that they didn’t perform as well as the Supracolors, I then pulled out the five closest hues in my Fancolor set (which does not include color numbers). Both dry and wet, I’d say the Prismalos look and feel closer to student-grade Fancolors than to artist-grade Supracolors. I didn’t bother to test them against Museum Aquarelles. Hmmm. I guess those are questions that only a true colored pencil geek would ponder. 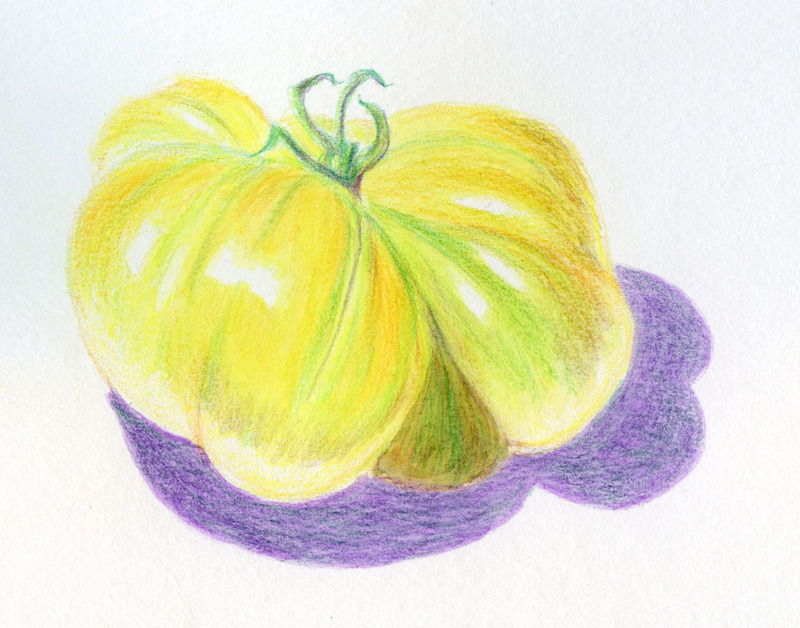 And ponder I did on yet another dreadfully rainy day, sketching a bright yellow heirloom tomato with the Prismalos. Despite being comparable to student-grade Fancolors, the cores applied pleasantly on Stillman & Birn Beta paper, and the hues became brilliant with water activation. I applied at least three layers of both dry and wet pigment; they blended beautifully when I wanted them to and held details nicely. P.S. I usually like to pick out all the produce we eat because I want to make sure they are sketchable. However, this heirloom was one that Greg got when he happened to go food shopping by himself. I tend to prefer heirlooms with at least some red in them, but this one gave me the fun opportunity of using a secondary triad palette. Maybe I should let him pick out the produce more often. 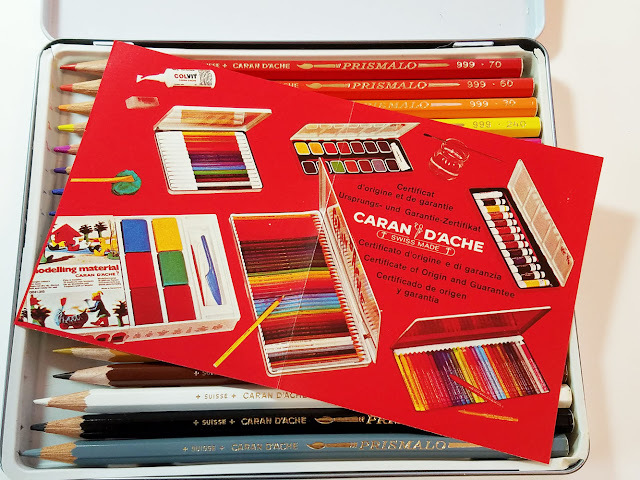 "I couldn’t find them on Caran d’Ache’s website, yet they do seem to be available on Amazon (at the kind of inflated prices often seen on discontinued products)." Not really, they're there, but you should've clicked the "international" language version, I suppose they're just no longer shipped to US. The box you got does look like an older version of the product, since the silver prints are a bit different nowadays. They use the same pigments as supracolor (some artist claim that Supracolors are less lightfast than Prismalos) yet the core is 0,8 mm smaller (or should I say narrower?) diameter and is significantly harder, better suited for more detailed work ("scientific drawing" as the site claims). They are also a bit cheaper. I'm pretty sure their solubility is better as well. Thanks for the info, Moth! Good to know they are still available. Yes, they still exist, and are still widely available here (in Switzerland) https://store.carandache.com/ch/de/494-prismalo-aquarelle-assortiment-80-couleurs.html. And they still have the (same) Matterhorn image on the box (although withouth the pencil guy, it seems). Maybe they're just not imported in the US anymore, if they ever were? On the website it says that they are artist grade as well, but here they are sort of the 'common' ones you get even in supermarkets, the ones lot of people grew up with.